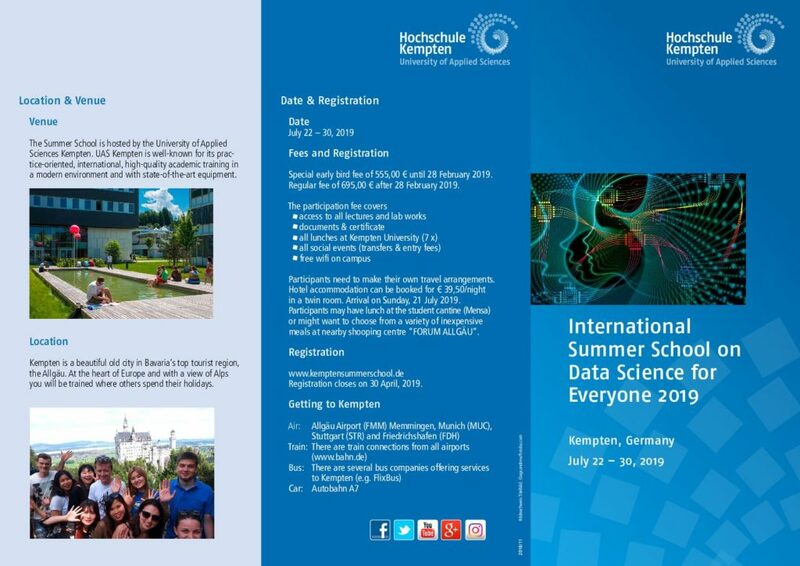 The International Summer School on „Data Science for Everyone“ is hosted by Kempten University of Applied Sciences. 1. Applications can only take place via the website by submitting the completed application form (contract offer). Payment by bank transfer is mandatory within 14 days once you have received your confirmation (acceptance of contract offer) in order to secure your place. Bank details will be sent with the letter of confirmation. 2. The participant cannot derive any rights from the application. 3. By submitting the application form the participant declares to have received these regulations and in addition declares himself/herself in agreement with its contents. 4. Registration closes on the date indicated on the website. 5. The University of Kempten accepts the contract offer by means of a written or e-mail order confirmation. 6. Students carry responsibility for their own insurance. Especially health insurance has to be proven. Kempten University does not accept any responsibility for such risks as injury, illness, loss or damage to property, etc. 7. Kempten University reserves the right to cancel the course. 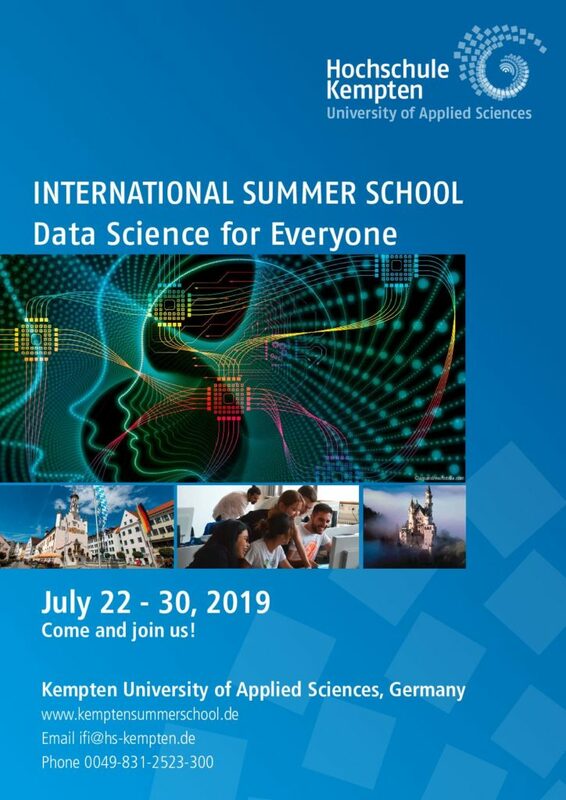 The Summer School organizers will within one week after the closing date (for registration) of the course either in writing or by e-mail inform participants of a cancellation due to lack of interest. Participants should keep this in mind when making travel arrangements; any expenses made will not be reimbursed. 8. A withdrawal is only possible for personal, unforeseeable, reasons for which you are not responsible, especially in the case of sickness, accident, death in the family; Reasons are to be proven, for example by presenting a medical certificate or death certificate. In such a proven case you will be reimbursed the course fee less an administration fee of €40.00. 9. Payment by bank transfer is mandatory within 14 days once you have received your confirmation. 10. If the course fee is not paid on time Kempten University shall be authorised to ban the participant from the course until the obligation to pay has been fulfilled. 11. In those cases for which the terms and conditions of registration do not provide, Kempten University will decide in reasonableness and in fairness. 12. Any disputes resulting from the agreement between the participant and Kempten University that cannot be resolved in mutual consultation will be brought before the Kempten Amtsgericht (local district court for civil court matters). 13. All personal user data collected as part of the registration process for the online portal and the completion of online forms is processed in accordance with the applicable statutory data protection provisions. This also applies to individual connection data saved in the online services which the system requires to be stored for a limited period of time. Data may not be passed on to any third parties unless the user has given his/her permission for this or the operator is obliged to publish such data due to legal regulations.